Foodworks is an Australian and independently owned supermarket chain that provide fresh groceries, products and services that match your lifestyle. Foodworks prides itself on its contemporary approach to retail whilst retaining a friendly, community-focussed relationship with its customers. 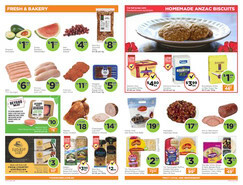 Shop at Foodworks online for weekly ads and catalogues to find the best deals, discounts and specials. Foodworks’ Equal Price Promise guarantees that you can purchase your favourite brands with confidence. 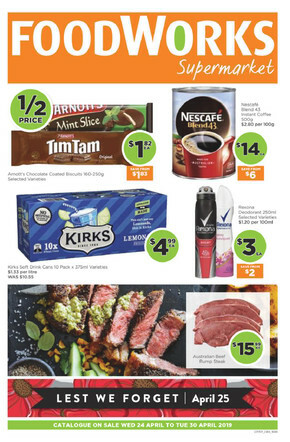 Every week, Foodworks check the prices on thousands of everyday products against one of Australia’s largest supermarket chains. Want great value for money? Shop at Foodworks, where you’ll never pay more than necessary. There are always new and exciting competitions to enter online at Foodworks. From Easter hampers and a year’s supply of Tim Tams to Macbook Airs and a $10,000 home theatre system, you’ll never want to shop anywhere else! Check out Foodworks online and see what competitions are currently running today! Get up-to-date information about opening hours and store locations or check out the latest flyers with the best deals, discounts and specials at the Shopfully website and app.